Fast food chain Shake Shack sprouted from a hot dog cart in Madison Square Park in Manhattan in 2001. All UK locations feature Hadrian Elite Stainless Steel toilet cubicles in the washrooms including one of the latest to open in the St David’s Centre in Cardiff. Hadrian cubicles are manufactured in Canada and distributed in the UK by Relcross Ltd, the Devizes based door and washroom hardware specialists. This modern day “roadside” burger stand serves up a menu of burgers, hot dogs, frozen custard, shakes, beer, wine and more and now boasts 100 outlets worldwide, about half of them in the USA. Shake Shack were familiar with Hadrian toilet cubicles in the USA and were delighted to find they were readily available in the UK too but with specifications adjusted to match UK requirements with longer cubicle doors and sightline gaps around the door edges eliminated. The Elite cubicles are finished in brushed stainless steel and they don’t just look good but are highly durable with easy clean low maintenance. Like Shake Shack, Hadrian are very committed to sustainability. Hadrian’s products feature a high recycled content with the stainless steel cubicles made from a total of 91% recycled content split 76% post consumer material and 15% pre-consumer material. They are also available powder coated to match any RAL colour or in a natural “galvannealed” steel finish. 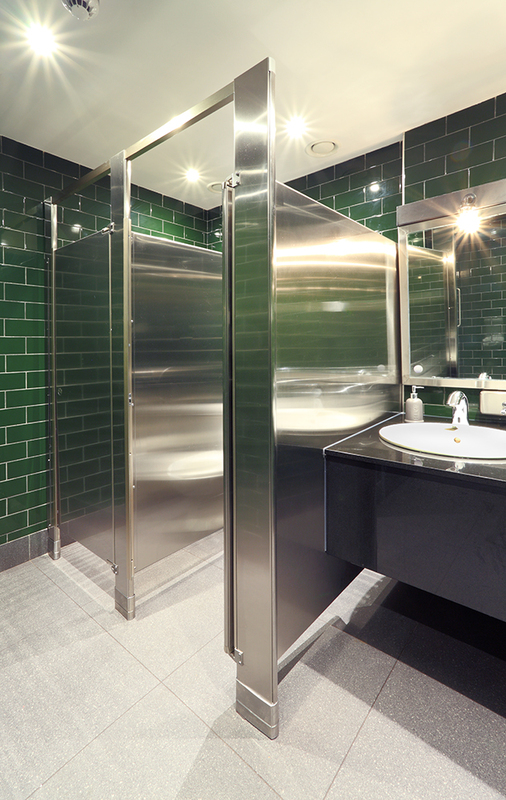 The ladies’ and men’s washrooms at Shake Shack in Cardiff each feature two floor mounted, headrail braced, stainless steel toilet cubicles with the addition of two matching urinal screens in the men’s washroom. Hadrian’s stainless steel is corrosion resistant to chemical cleaners, spray washing, and sanitizing agents and provides the most fire-resistant toilet partition material available. The Cardiff restaurant joins 3 other UK Shake Shacks in Covent Garden, Westfield Stratford and New Oxford Street, all in London, with more expected soon.